Anglesey, being an island on the west coast of Britain, can sometimes be a very windy place. The effects of the strong westerly winds can be seen in the numerous windswept trees around the island that grow in a distinctly easterly direction. The abundance of wind provided a useful source of energy and during the 18th and 19th century numerous windmills were built around the island. Almost 50 are known to have been built. Many of these are now in disrepair or have disappeared. However some have found new life. Llynnon Mill has been restored to fully working order. Others have been converted to dwellings and one has been reconstructed to house a mobile phone base station and mast. Many of the existing windmills were built during periods of drought in the 1740s when water mills were running at less than peak efficiency. The population of the island also increased at this time and the Corn Laws led to increase in grain prices, so more grain was grown and needed to be ground. Start a tour of the windmills, view a gallery of pictures of all mills, or see a list of all Anglesey windmills. The late 18th and early 19th centuries were the boom times of windmill building. However, increasing imports of foreign grain in mid 19th century led to price decreases, so many farmers converted their land to pasture for cattle and pigs, thus reducing the amount of grain that needed to be ground. Steam-powered milling on an industrial scale in the large ports such as Holyhead and Liverpool put further pressure on the ability of the local mills to compete and continue working. By the early 20th centuries only a handful of mills were still limping along, many powered by more reliable diesel engines rather than wind. The last working mill, Melin y Gof, closed in 1936. Llanerch-y-medd grinds best of all. Although all the current windmills were built from the mid 18th century onwards, there are records of earlier windmills that are long gone. The accounts of the Bailiff of Newborough state that a newly built windmill in Newborough began operation on 28 June 1303, after being built for £20, 12s 2½d (about £10,000 in today's money). In 1327 one was built on Mill Hill in Beaumaris, and another one was erected at an unknown location in 1495. In the 16th century the papers of the Baron Hill Estate around Beaumaris twice mention windmills. 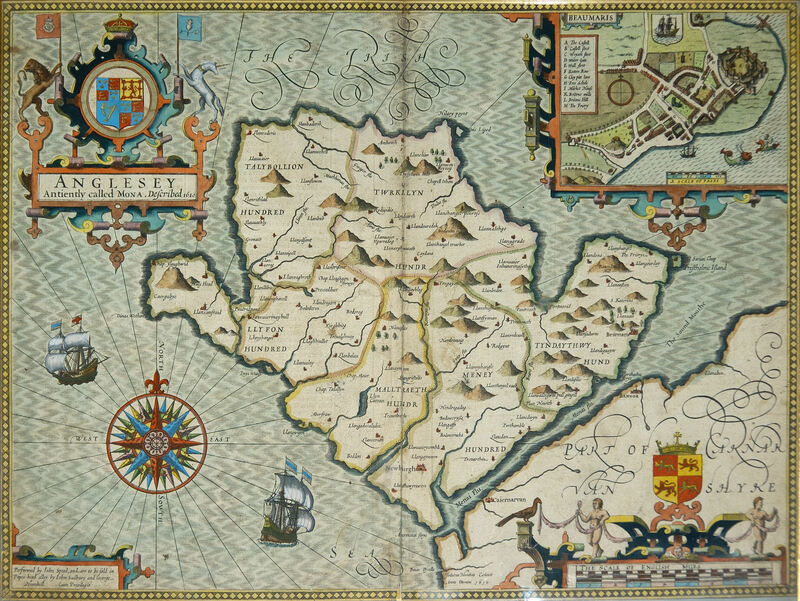 Also on John Speed's 1610 map of Anglesey the inset town plan of Beaumaris shows a windmill on the edge of the Menai Strait northeast from the castle. Whether this is one of the earlier mentioned mills is unclear, but it is unlikely to be the 1327 one as this isn't on a hill. Out of the 32 windmills of which some of the structure still remains, 14 have been converted into dwellings or incorporated into a larger house. Nine of these have been converted or renovated since 2000, showing the great increase of interest in restoring historic buildings. Of the remaining mills one has been fully restored to working order (Melin Llynnon), one is a mobile phone mast (Melin Wynt y Craig), 10 still stand to their full height (with three roofed), and six are partial towers or just the foundation. At least three of the empty towers have planning permission for future renovation. As in the 18th and 19th century, our current age is also looking for new, alternative and sustainable sources of energy. We have again looked at the wind resources of Anglesey and found them very suitable, with the result that three wind farms have been built on the island. They are all in the northwest near the Irish Sea. Not only is it windy, but there is also a major existing power line in the area linking Wylfa nuclear power plant to the national grid. The first to be built was Rhyd-y-Groes in 1992. It consists of 24 turbines, which produce 7.2MW of power, enough for around 4000 homes. In 1996 the Trysglwyn wind farm was opened with 14 turbines producing 5.6MW to power 3000 homes, followed closely in 1997 by the 34 turbines of the Llyn Alaw site, producing a massive 20.4MW for 11,000 homes. The local council's "Energy Island" strategy aims to supplement these in the future with sustainable tidal power, biomass processors and possibly a replacement nuclear plant for Wylfa, which is due to close in 2014. Planning applications for a large number of wind turbines around the island have been submitted, but these are now facing considerable opposition by those worried about the effects on tourism and property prices. Finally a note that not all that seems to be a converted windmill is actually a windmill. A house along the busy Pentraeth-Benllech road at Red Wharf Bay is often thought to be a windmill conversion. However, it is in fact a lime kiln. Locally quarried limestone was heated in kilns to produce lime for building, agricultural and industrial use. Lime kilns were built in a wide variety of building designs and this one was built as a tower similar to the windmill bases (perhaps calling on the skills of the local windmill builders). This one was converted in the 1950s by a prominent Liverpool architect and is currently for sale. Much of the information on this site comes from the excellent book by Barry Guise and George Lees, Windmills of Anglesey (1992), supplemented by my own research. This book is full of valuable information about the history of windmills on the island, many old photos of the mills, and a detailed illustrated narrative of the restoration of Melin Llynnon. The original print run of the book sold out soon after its 1992 publication and it became very hard to find copies. Fortunately a new edition was published in March 2010. The text has been updated with some of the latest information about the mills, and the number of photos of the mills, both old and new, has been expanded. There is also a section of paintings of the mills by prominent artists, including Kyffin Williams and Charles Tunnicliffe. 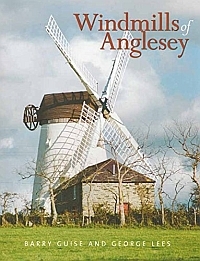 The Windmills of Anglesey book is available from Amazon.co.uk, the Oriel Ynys Mon shop and the shop at Llynnon Mill, as well as a number of other tourist sites in and around Anglesey (e.g. Maritime Museum and Ucheldre Centre in Holyhead, RNLI shop in Trearddur, Anglesey Sea Zoo, Stone Science, Plas Newydd and Amlwch Heritage Centre). See the article about the republication in the Holyhead and Anglesey Mail. Start a tour of the windmills or view a gallery of pictures of all mills. Click on the name of the mill to see more information, or on the OS coordinates (beginning with "SH") to find the mill on an OS map and streetmap.co.uk. All the mills can be seen on this Google map. If you have Google Earth installed you can add the windmills with this KMZ file. In Google Earth you can take a flying tour by selecting the "Windmills of Anglesey" entry and pressing the "Play Tour" button.